I wear my hair straight usually 1-2x a week and every time I share photos of my hair straight I get so many questions regarding how I get it so straight. My hair is naturally very straight – I’ve never been able to scrunch it or have a natural wave really. However, as I’ve gotten older, I do have a weird wave at the root in some places on my head which is annoying because I have to dry it well in order to get rid of the wave. Err! I heard that happens with pregnancy, too – oh joy! Anyway, although my hair is natural straight, I do have a very specific routine to make sure it is super straight, and sleek. I thought I’d share my favorite products and why I use them! Also, if you have not read my post on my HAIR CARE, you can read it HERE. This step is a big deal to me, I find that if I don’t use a heat protectant and an oil before I dry my hair, my hair is not as shiny or healthy looking. So as soon as I get out of the shower and let me hair towel dry, I spray It’s A 10 on the ends of my hair. This product is a heat protectant & it also helps your hair dry a little faster. Additionally, it helps to keep your ends from breaking off and splitting. Step #2 – I use this Altering Oil/Serum throughout my hair except at the roots. A girl at Sephora told me this helped her grow her hair out so I wanted to try it and I loved it so much I went through my first bottle too fast. This product really helps to hydrate your hair and bring it to life, it also helps to get that sleek, neat look that you want when you wear your hair straight. So, I am actually not super picky about hair driers at all but since I have thick hair, I like one that gets REALLY hot and is powerful so that I can blow dry my hair faster. I actually wasn’t super interested in this Moroccan Oil blow dryer initially, but the girl that does my hair uses it and I fell in love with it! I actually go to her like 2x a month just to have her wash and dry my hair bc I love the way it looks and feels after. I started to realize the only product she uses that I don’t use is this blow drier so I caved. Ahh! But, I have to say, I also have THIS blow drier for traveling and LOVE it! Not only is it beautiful (love the white), but it folds up and gets super hot so I always pack it when traveling. This is my favorite step of ALL when it comes to straightening my hair! This product smells like men’s cologne and is a-mazeeee-ing! It is a serum so you only need a dime size. After I blow dry my hair, I work this serum through the ends of my hair. I have sworn by this product for 12+ years, no joke. It protects your hair from the heat from the straightener and kind of seals your hair as your straighten it. It also keeps it very uniform and neat! I have mentioned this brush on here a ton, but it seriously the best brush ever. It is definitely quite the investment and I lusted after it for 3+ years until I finally broke down and get it but I love it! My girlfriends always use it when they are with me because they know it is so good. It just spreads your natural oils through your hair and makes your hair look so much healthier and less frizzy. I always use it simultaneously as I straighten my hair – almost as a guide of the straightener if that makes sense! Ha! Totally not necessary – I just love these clips. In fact, I swear by them and if someone ‘steals’ mine (lol, looking at you mom!! ), I have to go get a new one ASAP. If you have thick hair, then you know it can be hard to find clips that hold your entire head of hair and stay put – but this one does just that. It’s def not necessary but I love them. I once was traveling and forgot to pack mine and had to go out of my way to find a JCrew and buy a new one! 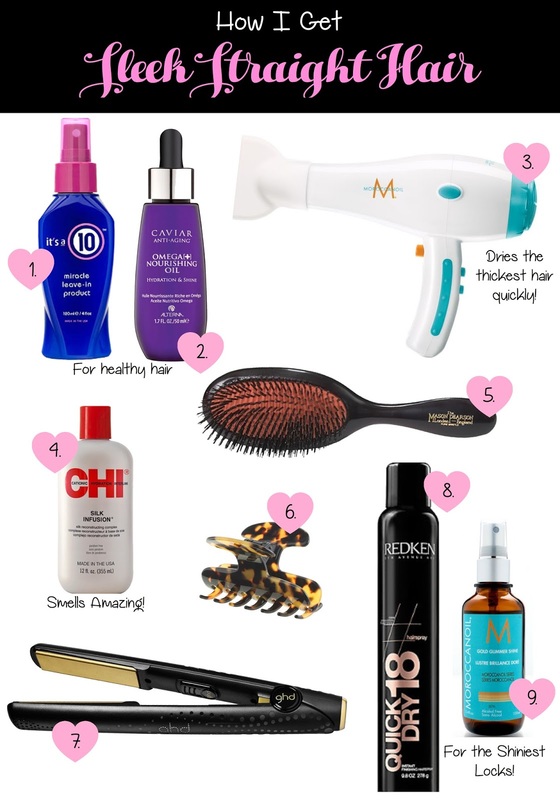 There are a couple of straighteners I really love – the t3micro and the GHD. Personally, I find that the the GHD straightener does the better job on my hair. When you plug it in, it heats up in under 60seconds (I think?) and it beeps when it is hot. It takes me under 30 minutes to straighten my whole head of hair. It is a smooth feeling straightener so it doesn’t catch or pull and the one I am using, I have had for 4 years! I love the T3 as well and I have THIS one for travel. It is ideal for traveling bc it is small and has a little travel thing that goes around it to keep it safe. I always always tease my hair after straightening! A lot of time it is super flat on top from all the straightening, so I tease it, and use THIS hairspray. It’s my favorite hairspray! Last, but certainly not least is the shine spray. This is the KEY to having super sleek straight hair and oh em gee, you will love this stuff. I spray it on my hair and then rub it through my hair and it makes my hair look super healthy and shiny. I highly recommend this product no matter what hair style you are going for – it will make your hair look so vibrant and shiny! Below is a photo of my hair straight w/balayage so you can get a better look! I really liked this article i love to keep my hair straight and this topic helped a lot. i liked all your products very nice. I have super thick/course hair and RECENTLY bought the chi oil to help tame and make my hair more silky. however, the oil made my skin break out. Do you have any alternative PRODUCTS you recommend that can be used for this purpose? Ohhhh you just need something for when you straighten it?! Cracked my STRAIGHTENER on the tile floor, but hey, at least it wasn’t the tile! so i came to this post to research a new one. I’ve heard other good reviews so I’m going to give the GHD a try. My hair is corse and really thin so one that does’nt catch or pull is key. On another note, what do you do with your hair while you sleep?! Kind of a crazy question but geesh my hair is never brush and go lol Sticks to my neck and the ends are always kinked. I try putting it up in a scrunchy but it mostly slips out. Any tips appreciated! Ps, I’m obsessed with the Caviar line. been using The anti aging spray for years and its always a game changer!